The main author, Dr Pamela A. Popper, PhD, ND, is a naturopath, an internationally recognized expert on nutrition, medicine, and health, and the Executive Director of The Wellness Forum. Dr. Popper serves on the Physician’s Steering Committee and the President’s Board for the Physicians’ Committee for Responsible Medicine in Washington, D.C. The other author, Glen Merzer is coauthor with Howard Lyman of Mad Cowboy, and with Howard Lyman and Joanna Samorow-Merzer of No More Bull!, and with Chef AJ of Unprocessed. He has been a vegan for the last 20years. The format of the book is very unusual. 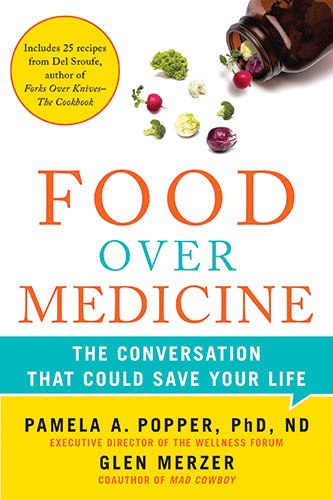 In Food Over Medicine, Dr Pamela and Glen Merzer invite the reader into a conversation about the dire state of American health—the result of poor nutrition choices stemming from food politics and medical misinformation. Backed by numerous scientific studies, the book details how dietary choices either build health or destroy it. The book (released June 2013) imparts a lot of information, but it’s a very easy read, due in large part to the conversation style format in which it’s written. Glen Merzer and Pam Popper discuss everything from health-promoting/destroying foods, to supplements and healthcare. They talk about screening and diagnostic tests such as mammograms and PSA tests, and whether or not they are beneficial, harmful or useless. The subject matter is certainly not light but they manage to create an atmosphere in which you feel at ease, as if you’re sitting at the table listening to these two knowledgeable, witty professionals. The best part of the book is that nearly everything they say is referenced. While some stories are shared, the recommendations are always supported by the science. That being said, the data is laid out in such a way that the reader is engaged and interested without feeling dazed and confused. Many common myths are debunked and there are even some tasty recipes in the center of the book, courtesy of vegan chef Del Sroufe. Overmedicated, overfed, and malnourished, most Americans fail to realize the answer to lower disease rates doesn’t lie in more pills but in the foods we eat. With so much misleading nutritional information regarded as common knowledge, from “eat everything in moderation” to “avoid carbs,” the average American is ill-equipped to recognize the deadly force of abundant, cheap, unhealthy food options that not only offer no nutritional benefits but actually bring on disease. (Comment: Malaysians are not very far away). The environment is often responsible for cancer initiation, but not usually promotion; it is the diet that promotes the cancer. No other population (besides America) has ever had such unlimited access to so many bad foods. The overall state of health of Americans as a population is very sick and very overweight. A lot of people in this country (US) are overfed, but are still malnourished (same as in Malaysia also). Most breast cancers are estrogen receptor positive, so elevated blood levels of estrogen increase the risk of breast cancer…all cow’s milk has estrogen metabolites because it comes from lactating cows. Regarding protein: the protein needs for normal adults may be as low as 2.5 % of calories. We eat way too much protein. Animal protein consumed in excess of what humans need becomes a powerful cancer promoter (read Dr Colin Campbell’s studies as reported in The China Study).The cancer–promoting effect of proteins has been proven to be limited to animal proteins. The general medical wisdom about the etiology (cause) of most diseases comes down to genes, bad luck, and we don’t know..!! Alzheimer’s is rarely present in plant-eating population; it is a disease of the western diet. It’s a vascular disease that is most present in the population that eats the most meat. In the case of osteoporosis, it isn’t the fracture that killed them; it’s the poor health (from a high fat diet and lack of exercise) and the drugs they were taking that caused the fall in the first place. Eating animal food causes the body to use calcium drawn from the bones to buffer the acid in order for the body to maintain blood within a very narrow range. Rheumatoid arthritis is almost always diet and lifestyle related and is particularly related to the consumption of animal foods. Chicken is just another animal food, and a particularly filthy one at that. Chicken, even white meat chicken is high in fat. Dairy is the most toxic of all – high fat, high- protein, zero fiber, low-carbohydrate. Dairy proteins have been linked to a string of diseases including asthma, allergies, autoimmune diseases, breast cancer, and prostate cancer. Dairy products increase the hormone called insulin-like growth factor (IGF-1) which is a powerful cancer promoter in humans. Refined sugary foods elevate triglycerides and triglycerides are blood fats waiting to cause mischief. Not only do sugar do not provide any nutritive value, they are destructive to health in terms of elevating blood sugar and suppressing immune function. Dried fruit –firstly, it is high in calories. Secondly, there are lots of sulfites, coloring agents, and sugar in many dried fruit products. Fruit juices are concentrated calories and sugar. Instead of drinking apple juice, eat apple; instead of orange juice, eat oranges. Coffee – there is no question that caffeine is a drug. 5) PREVENT AND REVERSE HEART DISEASE by Dr Caldwell B. Esseltyn, MD (learn how a plant-based diet can reverse heart diseases). To know more of Dr Popper’s views on nutrition…..just type in Pamela Popper in YouTube…lots of videos to enlighten you.